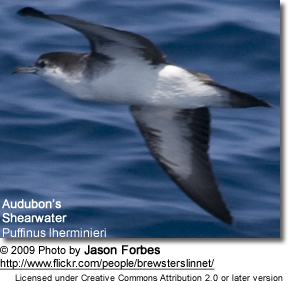 Audubon's Shearwater, Puffinus lherminieri, is a common tropical seabird from the family Procellariidae. Sometimes called Dusky-backed Shearwater, the scientific name of this species commemorates the French naturalist Félix Louis L'Herminier. Certain populations are also known as Baillon's Shearwater or Tropical Shearwater, Bannerman's Shearwater, Mascarene Shearwater and Persian Shearwater; some of these are considered distinct species by various authors. If they are all placed in P. lherminieri, the North Atlantic Little Shearwater (otherwise often separated as P. baroli) is generally included here too. Thus, these small shearwaters form a cryptic species complex. Audubon's Shearwaters are on average 30 cm (12 in) in length—about half the size of the Greater Shearwater ("Puffinus" gravis)—and weigh 170 g. There is some variation between populations and the normal size and weight range is 27–33 cm and 150–230 g. The wingspan is 64–72 cm, the tail is around 8.5 cm long, the exposed culmen measures 3 cm or slightly less, and the tarsus is around 4 cm in length. In general appearance, it is a small shearwater, black above and white below and hard to distinguish from its relatives at first glance. The upperparts, rectrices and undertail coverts (vent) are blackish-brown, as are at least the distal undersides of the remiges (flight feathers), but sometimes the entire feathers. The rest of the underparts are white, as is the head below eye level. The iris is dark, the feet are dull pink with a black wash and black toenails, and the bill is grey, darker towards the tip, and with a pinkish hue. It can be confused with the Manx Shearwater (P. puffinus), which has white undertail coverts (vent) and in direct comparison a longer bill. Other similar-looking species are usually completely allopatric, though the largely subantarctic Little Shearwater (P. assimilis) may occasionally range into waters where P. lherminieri is normally found. It has more white on the face and underwing, a smaller bill and greyish-blue feet. If not split into several species, Audubon's Shearwater ranges across the Indian Ocean north to the Arabian Sea, throughout the northwest and central Pacific, in the Caribbean, and parts of the eastern Atlantic. It is a species of tropical waters; only some Atlantic populations and Bannerman's Shearwater of the Ogasawara Islands occur farther north. Unlike the larger shearwaters, adult Audubon's Shearwaters are not thought to wander much or undertake great migrations, although their young birds do so before breeding, and western Indian Ocean birds may gather in large numbers at the upwelling zone in the Arabian Sea. It is adaptable as regards its preferred marine habitat; it can be found in pelagic (over sea), offshore and inshore waters. It feeds in a variety of methods, mainly diving out of flight, plunging underwater from a swimming position, and picking up food less than a bill's length underwater while "pattering" as if it were walking across the waves. It eats small fish, squid and planktonic crustaceans. Unlike other shearwaters, it is not commonly a ship-follower, though it may attend small fishing boats; it is also sometimes met with as part of a mixed-species feeding flock. The species is colonial, nesting in small burrows and crevices in rocks and on earthy slopes on atolls and rocky islets. The breeding season varies according to location and subspecies, but how precisely is not very well-studied. Both parents share the responsibility of incubating the single white egg (measurements of 52.5 by 36.2 mm and a weight of 37 g have been recorded for one specimen of average size), each incubating for periods of 2 to 10 days until the egg hatches after 49–51 days of incubation. The nestlings are brooded for half a week to one week, after which time the parents will leave it mostly alone in the burrow and spend most of their time foraging and feeding their voracious offspring, which become very fat. Time from hatching to fledging is 62–75 days. 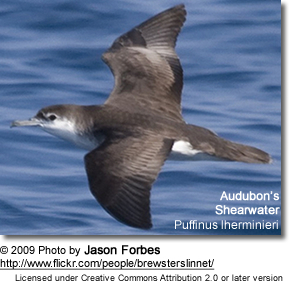 Audubon's Shearwaters take about 8 years to reach breeding age. As typical for Procellariiformes they are long-lived for their size, one bird ringed as an adult was still alive 11 years later; it must have been more than 15 years old at that time. Puffinus lherminieri lherminieri Lesson, 1839 – breeds throughout the Caribbean, on the Bahamas and formerly on Bermuda; ranges throughout the Caribbean and up the North American Atlantic coast up to southern Canada, with vagrants having been recorded off northeastern Canada. A small breeding colony found in 1993 in the Itatiaia Islands off Vila Velha (Espírito Santo, Brazil) probably belongs to this subspecies. Includes loyemilleri. Puffinus lherminieri baroli (Bonaparte, 1857) – breeds on Azores and Canary Islands (E Atlantic); ranges throughout E Atlantic around (but mostly north of) the Tropic of Cancer. Puffinus lherminieri boydi Mathews, 1912 – breeds on Cape Verde Islands (E Atlantic); ranges throughout E Atlantic around (but mostly south of) the Tropic of Cancer. The former two have more white on the face and bluish feet like the Little Shearwater, with which they were formerly placed and are considered a distinct species (North Atlantic Little Shearwater, P. baroli) by some, depending on whether biogeography and morphological differences or the genetic similarity are considered more significant, and what other lineages are considered distinct from P. lherminieri in a particular treatment. The southern Caribbean birds were separated as P. l. loyemilleri, but are not distinct. Puffinus lherminieri persicus Hume, 1837 – breeds on Khuriya Muriya Islands (Arabian Sea); ranges throughout the Arabian Sea. Puffinus lherminieri temptator Louette and Herremans, 1985 – breeds on Mohéli (Comoros); ranges in W Indian Ocean around the northern end of Madagascar. If P. bailloni is accepted as a distinct species but P. persicus is not, this latter group would have to be included in P. bailloni. Puffinus lherminieri bailloni (Bonaparte, 1857) – breeds on Mascarene Islands (SW Indian Ocean); ranges throughout the SW Indian Ocean to the north of the Tropic of Capricorn, and vagrant birds seen off South Africa probably belong to this subspecies. Includes atrodorsalis. Puffinus lherminieri dichrous Finsch and Hartlaub, 1867 – breeds throughout central Polynesia and possibly Melanesia (Pacific) and the NW Indian Ocean up to the Arabian Sea; ranges throughout the W Indian Ocean around the Equator, and in the C Pacific from the equatorial region to the Tropic of Capricorn. Includes colstoni, nicolae, polynesiae and maybe gunax; vagrants seen off Australia could belong to dichrous or gunax (if valid), while vagrants recorded from Guam and Rota (Marianas) might be dichrous or bannermani. This group is the most confusing of all. The subspecies dichrous occurs in two areas which appear to be separated by the whole of Indonesia and the seas surrounding it; the Pacific subpopulation includes the proposed subspecies polynesiae (Ta‘ū, American Samoa) and possibly gunax (see below), whereas the geographically separated Indian Ocean subpopulation contains the birds formerly separated as nicolae (NW Indian Ocean, from Aldabra to the Maldives) and colstoni (Aldabra, Arabian Sea). There appear to be no significant genetical or morphological differences between these birds, which is quite amazing given that the Pacific and Indian Ocean subpopulations must have been isolated for a fairly long time, and that no less than three unequivocally distinct subspecies (bailloni, persicus and temptator) occur within the range of Indian Ocean dichrous. On the other hand, the supposed species Mascarene Shearwater ("P. atrodorsalis") is inseparable morphologically and genetically from bailloni. Clearly, some mechanism blocking gene flow is at work, but what this is exactly remains unknown – though as remarked above, separate breeding seasons seem a reasonable assumption and are tentatively supported by the available field data. In addition, it is entirely mysterious why such a mechanism should apply in the rather limited and ecologically homogenous northwestern Indian Ocean range, but not in the ecologically more diverse and by far larger Pacific range of dichrous. These unresolved problems nonwithstanding, this clade – possibly including the preceding one – has been proposed to constitute a separate species, the Tropical Shearwater or Baillon's Shearwater, Puffinus bailloni. Puffinus lherminieri bannermani Mathews and Iredale, 1915 – breeds on Ogasawara Islands (NW Pacific); ranges throughout the NW Pacific from Japanese waters to the equatorial region. Vagrants recorded from Guam and Rota (Marianas) might be dichrous or bannermani. Puffinus lherminieri gunax Mathews, 1930 – breeds on Banks Islands of Vanuatu (SW Pacific); ranges throughout the SW Pacific between the equatorial region and the Tropic of Capricorn. Might belong in dichrous; vagrants seen off Australia could belong to either taxon. These taxa could not be included in the most recent studies due to lack of material. The case of gunax seems fairly straightforward – as certainly as this can possibly be said in the absence of new data, it belongs to the bailloni clade either as a distinct subspecies, or, more likely, as yet another synonym of dichrous.